Ho ho ho! Christmas cheer is spreading throughout the Ten June household! So far, I've got the tree up and it's decorated with a few of my DIY cranberry glass ornaments. 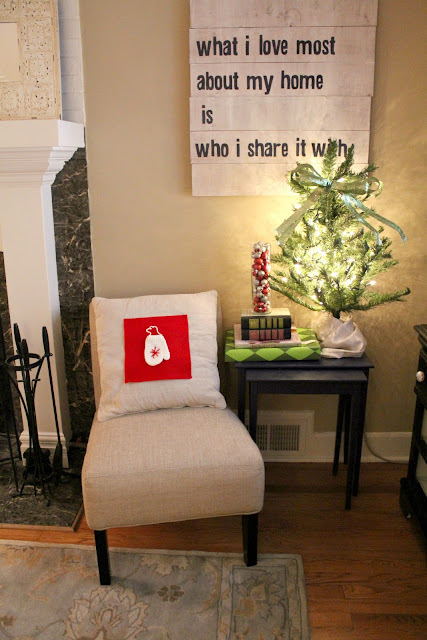 Because we put the Christmas tree up in the living room where our slipper chairs and nesting tables usually go, I had to move one of the chairs and the table to the tiny corner of the room by the television, right under my favorite new rustic DIY wall sign. It's kind of a cramped space, but it will work for December! Needless to say, that's where I decided to set up a sweet little holiday vignette. I set up a tiny Christmas tree and wrapped its base in leftover linen fabric I had laying around. I dressed it with a glittery bow, but instead of putting ornaments on the tree, I decided to try a little something different and fill up a vase with sparkly ornaments beside the tree. I think they look great! For the slipper chair, I simply pinned a swatch of red felt onto the front of our sofa's linen pillows. Since these are our everyday pillows, I didn't want to make a permanent holiday pillow, but I'm sure you could recreate this idea and actually sew the felt on... and it would look a whole lot more snazzy too! : ) I also pinned on a mitten ornament that I found on sale at JoAnn's. Voila! 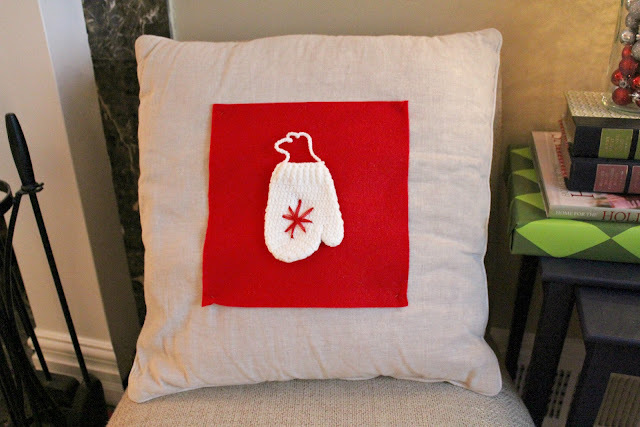 An easy breezy holiday pillow. So there you have it, my little holiday vignette! 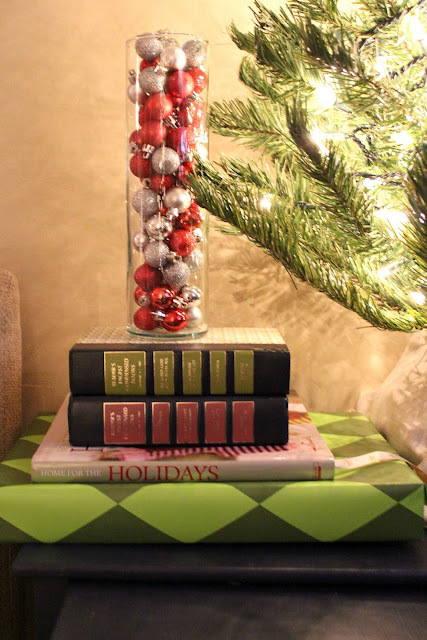 Have you set up any fun holiday related spaces in your home? 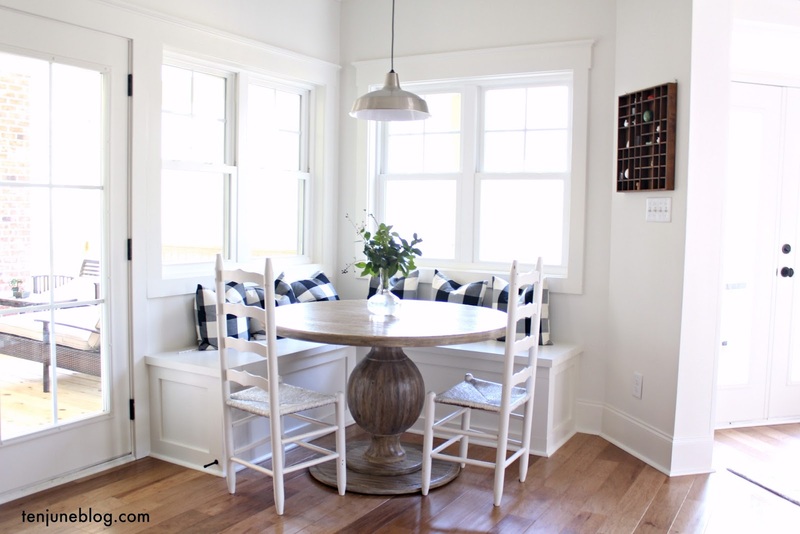 Maybe you decorated a sideboard, prettied up a counter top or tinseled your entryway? 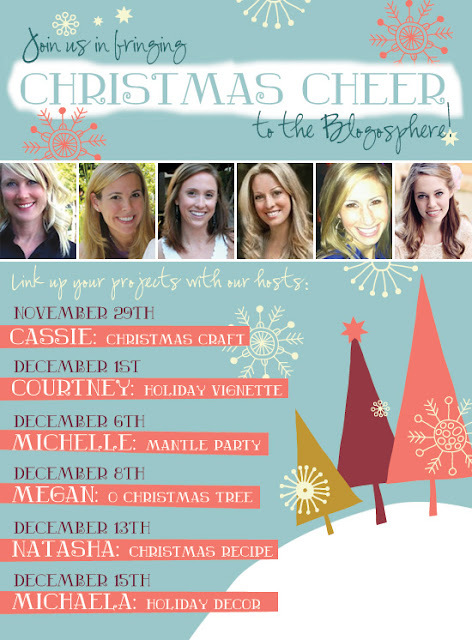 If so, you better get on over to Courtney's blog, A Thoughtful Place, and link up with her today! And don't forget, the Christmas decor party keeps rocking next week right over here at Ten June. We'll be linking up and sharing holiday mantles next Tuesday! That looks perfect! I have a little wall nook area in my house that I am trying to figure out what to do with it, and I think a little tree would look perfect! And I absolutely adore your word art. I love that quote! So funny I have been on the lookout for a Christmas pillow! 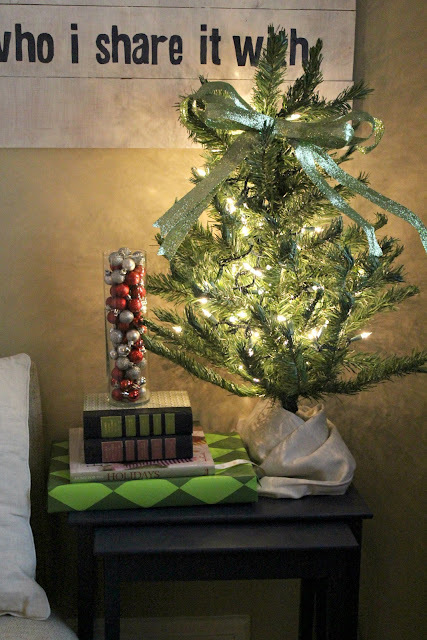 Love your little tree and great idea to put the ornaments in a jar. I have ornaments in bowls all over my house- it's probably overkill but I love Christmas decorations! Adorable! Love the little mitten! so adorable! reminds me to finish up aston's baby tree! The little tree is adorable! And love the Christmas themed books! Great job girlfriend! That little corner is so cute!! Great idea for a temporary pillow, too!! I've got a giant armchair in my closet right now...talk about musical furniture to make room for the tree!!! Simple and cute! What a cozy little corner! Love it, girl! I always stack with themed books, too! I love that little tree. We have moved so much furniture around it's almost ridiculous to decorate! Darling vignette and I love the books. The pillow is so cute and the vignette is adorable.....Vignette's are always so hard for me to put together, thanks for the inspiration! I LOVE it! What a cutie little tree! I want one for my desk!! I like that you have pretty holiday books too! Festive & fun! I love your idea of turning everyday pillows into a holiday pillow. We're decorating this weekend- can't wait!! !